Laurie Here - Contemporary Fiction and MORE - Book Reviews: "Showers of Books Giveaway Hop" April 20th to April 25th! "Showers of Books Giveaway Hop" April 20th to April 25th! GREAT thanks to our sponsors of this Giveaway Hop to One a Day YA and I Am A Reader, Not A Writer Without them, this Hop would not be possible. THANK YOU!!! 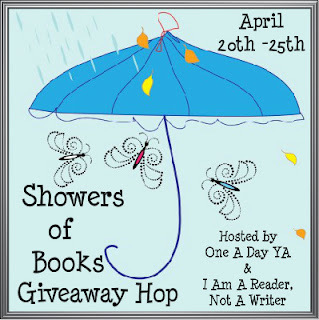 "SHOWERS OF BOOKS GIVEAWAY HOP!" April 20th to the 25th, 2012! Come and see what I have to give away! If you would like to ENTER this Giveaway Blog Hop, then click up on the TAB above called "GIVEAWAYS" OR click on HERE! NOTICE! THERE ARE "2" BLOG HOPS GOING ON AT THE SAME TIME! WOO-HOO!!!!! You have to scroll ALLLLLLLLLLLL the way down, past ALLLLL the other Blogs that are participating in the in 'THIS HOP' to ENTER THE "NO STRINGS ATTACHED GIVEAWAY BLOG HOP!" Now through Sunday, the 22nd! Woo-hoo! 2 in 1 Blog! "Win a Chance for an Amazon $100 Gift Card - VOTE "TEAM ABNEGATION - DIVERGENT/INSURGENT! Harper Teen is going to REVEAL what FOUR has to say 'if' they get 35,000 copies of "Insurgent" pre-ordered! Let's find out what FOUR has to say!!! You will see it when you click on my TAB above and GO TO THE LINK!!! I can't wait until Insurgent comes out. Preordered it last week.